Which is your business area? Need a complete 3D CAD system with different modules adapted to your workspace. Prefer to influence the development of your workflow. Need a format that is compatible with both coordinate data, CAD data and GIS data. Work with different types of data such as vectors, raster, terrain models and point clouds. Want to meet deadlines and deliver correct data for big projects. Want to create effective and simple basis for deliveries. Want to update drawing stamps and drawings automatically in the system. Want to reduce errors and increase project qualities by creating drawing lists automatically in MS Word. Need to find the right files through meta data and quick searches. With Chaos desktop, we can get the right data in our rebuilding project of Södersjukhuset (hospital in Stockholm). Topocad is adjustable and works great with Metrias Geoassistant service. Operation Manager for databases and software applications, Metria. Welcome to Adtollo! We are experienced software suppliers for those who build society. We can help you in areas such as data coordination, drawing and document management, CAD, GIS, mapping and surveying or pure calculation assignments. Our software helps you to bring order to your chaos. 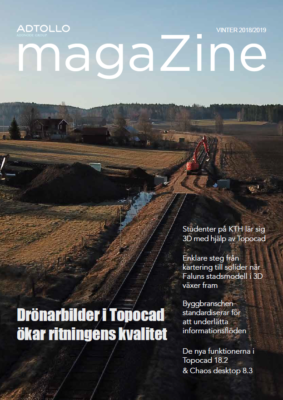 The winter issue of Topocad magaZine!